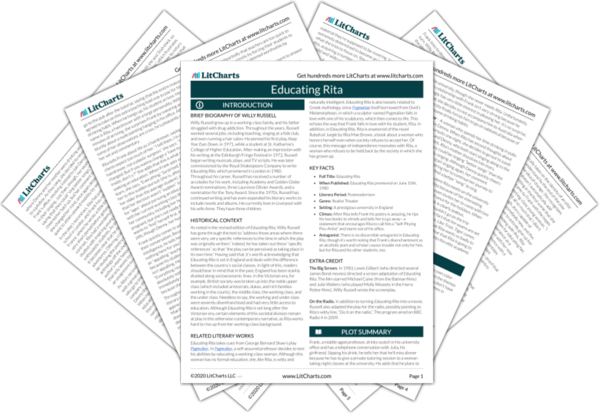 Instant downloads of all 946 LitChart PDFs (including Educating Rita). Welcome to the LitCharts study guide on Willy Russell's Educating Rita. Created by the original team behind SparkNotes, LitCharts are the world's best literature guides. A concise biography of Willy Russell plus historical and literary context for Educating Rita. A quick-reference summary: Educating Rita on a single page. In-depth summary and analysis of every Act of Educating Rita. Visual theme-tracking, too. Explanations, analysis, and visualizations of Educating Rita's themes. Educating Rita's important quotes, sortable by theme, character, or Act. 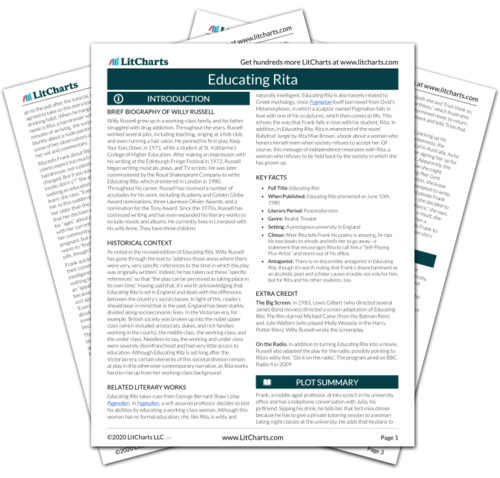 Description, analysis, and timelines for Educating Rita's characters. Explanations of Educating Rita's symbols, and tracking of where they appear. An interactive data visualization of Educating Rita's plot and themes. Willy Russell grew up in a working-class family, and his father struggled with drug addiction. Throughout the years, Russell worked several jobs, including teaching, singing at a folk club, and even running a hair salon. He penned his first play, Keep Your Eyes Down, in 1971, while a student at St. Katharine’s College of Higher Education. After making an impression with his writing at the Edinburgh Fringe Festival in 1972, Russell began writing musicals, plays, and TV scripts. He was later commissioned by the Royal Shakespeare Company to write Educating Rita, which premiered in London in 1980. Throughout his career, Russell has received a number of accolades for his work, including Academy and Golden Globe Award nominations, three Laurence Olivier Awards, and a nomination for the Tony Award. Since the 1970s, Russell has continued writing and has even expanded his literary works to include novels and albums. He currently lives in Liverpool with his wife Anne. They have three children. 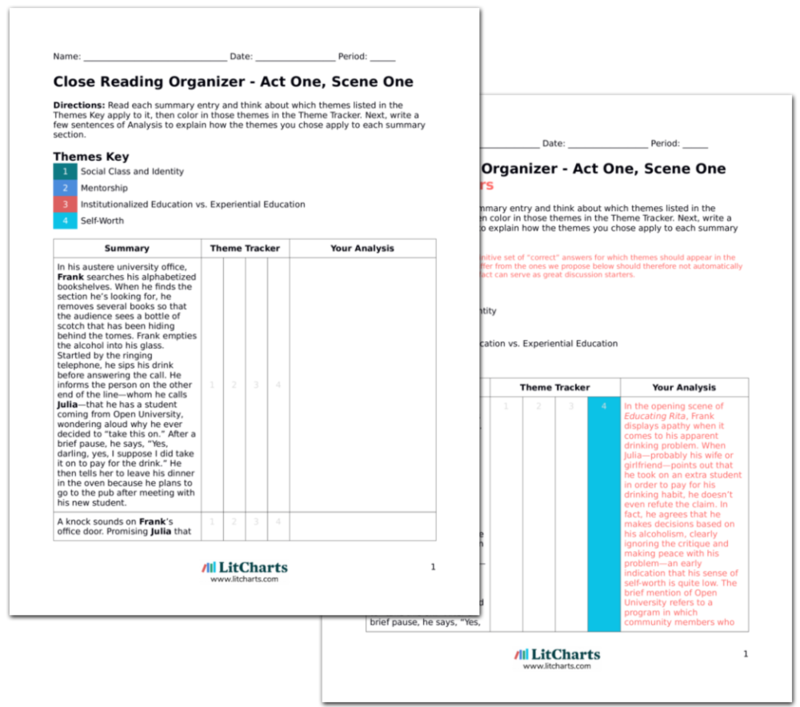 Get the entire Educating Rita LitChart as a printable PDF. As noted in the revised edition of Educating Rita, Willy Russell has gone through the text to “address those areas where there were very, very specific references to the time in which the play was originally written.” Indeed, he has taken out these “specific references” so that “the play can be perceived as taking place in its own time.” Having said that, it’s worth acknowledging that Educating Rita is set in England and deals with the difference between the country’s social classes. In light of this, readers should bear in mind that in the past, England has been starkly divided along socioeconomic lines. In the Victorian era, for example, British society was broken up into the noble upper class (which included aristocrats, dukes, and rich families working in the courts), the middle class, the working class, and the under class. Needless to say, the working and under class were severely disenfranchised and had very little access to education. Although Educating Rita is set long after the Victorian era, certain elements of this societal division remain at play in this otherwise-contemporary narrative, as Rita works hard to rise up from her working-class background. Educating Rita takes cues from George Bernard Shaw’s play Pygmalion. In Pygmalion, a self-assured professor decides to test his abilities by educating a working-class woman. Although this woman has no formal education, she, like Rita, is witty and naturally intelligent. Educating Rita is also loosely related to Greek mythology, since Pygmalion itself borrowed from Ovid’s Metamorphoses, in which a sculptor named Pygmalion falls in love with one of his sculptures, which then comes to life. This echoes the way that Frank falls in love with his student, Rita. In addition, in Educating Rita, Rita is enamored of the novel Rubyfruit Jungle by Rita Mae Brown, a book about a woman who honors herself even when society refuses to accept her. Of course, this message of independence resonates with Rita, a woman who refuses to be held back by the society in which she has grown up. Climax: After Rita tells Frank his poetry is amazing, he rips his two books to shreds and tells her to go away—a statement that encourages Rita to call him a “Self-Pitying Piss-Artist” and storm out of his office. Antagonist: There is no discernible antagonist in Educating Rita, though it’s worth noting that Frank’s disenchantment as an alcoholic poet and scholar causes trouble not only for him, but for Rita and his other students, too. The Big Screen. In 1983, Lewis Gilbert (who directed several James Bond movies) directed a screen adaptation of Educating Rita. The film starred Michael Caine (from the Batman films) and Julie Walters (who played Molly Weasely in the Harry Potter films). Willy Russell wrote the screenplay. On the Radio. In addition to turning Educating Rita into a movie, Russell also adapted the play for the radio, possibly pointing to Rita’s witty line, “Do it on the radio.”. The program aired on BBC Radio 4 in 2009. Lannamann, Taylor. "Educating Rita." LitCharts. LitCharts LLC, 7 Jun 2018. Web. 23 Apr 2019. Lannamann, Taylor. "Educating Rita." LitCharts LLC, June 7, 2018. Retrieved April 23, 2019. https://www.litcharts.com/lit/educating-rita.